Man, I love tacos. Like…tacos are right up there with pizza, burgers, and wings. It’s one of the few foods that I truly crave and it’s one of those foods that, while simple, can also be easy to screw up. 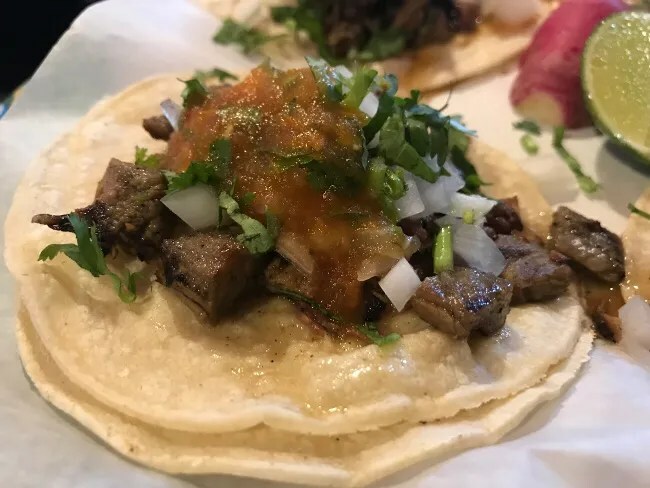 My favorite taco place is Taqueria San Jose in Grand Rapids. A co-worker and I used to each order five tacos on Friday nights and wash it down with some root beer. They are just such simple tacos. Steak, onions, cilantro and corn tortillas but the steak they use is so flavorful and so tender. Getting that tasty tender combo seems to be the hardest thing with steak tacos. I’ve had so many from so many different places over the years and very few even come close to San Jose. Withing the last few weeks, one of my new favorite burger places just opened up a a new taco place. I figured if they do tacos half as well as they do burgers, this place was going to be a hit. 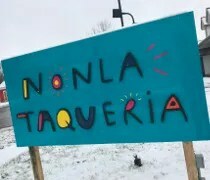 Nonla Taqueria is the newest addition to the Nonla stable that includes Nonla Burger and Nonla Vietnamese Street Food. The taqueria is on US-131, or North Grand Street as it’s known as it goes through Schoolcraft. The building sits a little way off the road and there’s a big parking lot that wraps around the building. The last time I was in this building was in 2010 when this place was Up In Smoke BBQ. The layout doesn’t look to have changed but holy cow does this look like a different space. The restaurant is set up with an order counter straight ahead as you walk in the door. The Mexican theme becomes apparent right away with white and blue subway tiles on the font of the counter and a display of Jarritos pop off to one side. Nonla’s restaurants area always super popular and they’re always in pretty tiny buildings. Nonla’s Taqueria is probably the biggest of the three but there are still only about ten tables in brightly painted the space. 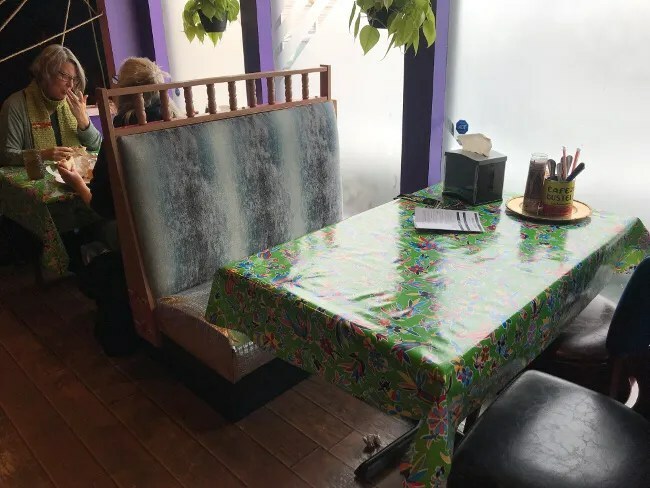 In one section there are a couple of booths along one wall, a large table near the kitchen, and a few more four tops to complete the seating options along the outside walls. Another smaller dining area has two more four tops and two two tops. 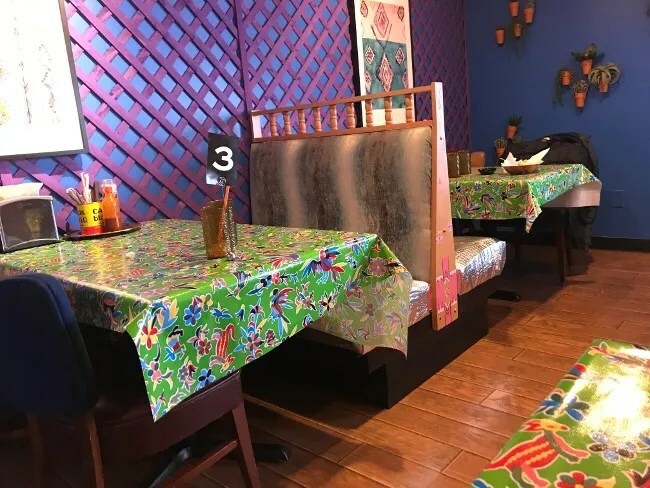 All of the tables have brightly patterned Mexican themed table cloths on top of them. 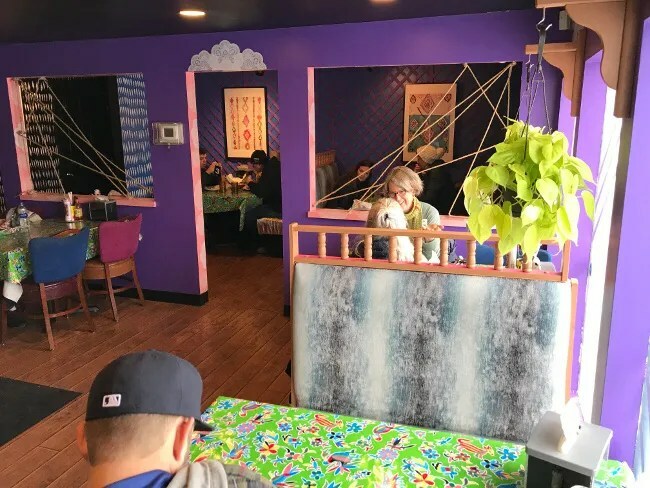 The wall decor is pretty minimal with a few painted clouds on top of the purple paint and just a couple of paintings hanging to give the place some depth. I put in my order for four steak tacos and took a seat at one of the two tops on the other side of the half wall separating the two rooms. I actually decided to eat in even though I was dining alone because I wanted to get the chips and salsa after I saw them come out to another table while I was waiting to order. Like everything else at Nonla restaurants, the chips are home made and insanely delicious. They’re the kind of chips I’ve only ever had at home when I’ve taken the time to fry corn tortillas up myself. They’re light, airy, a little greasy, and a tad salty. 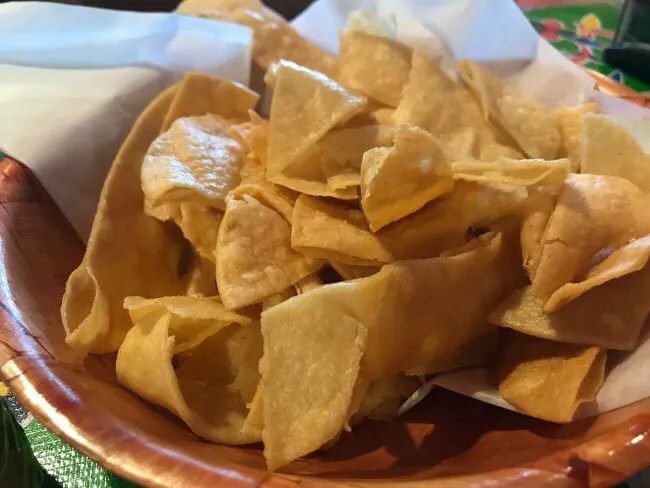 These are the kind of chips that work even without salsa. The salsa is also good on it’s own…almost good enough to drink. It’s a thin salsa without a lot of big chunks so you really good a mixture of flavors with every dunk of the chip. 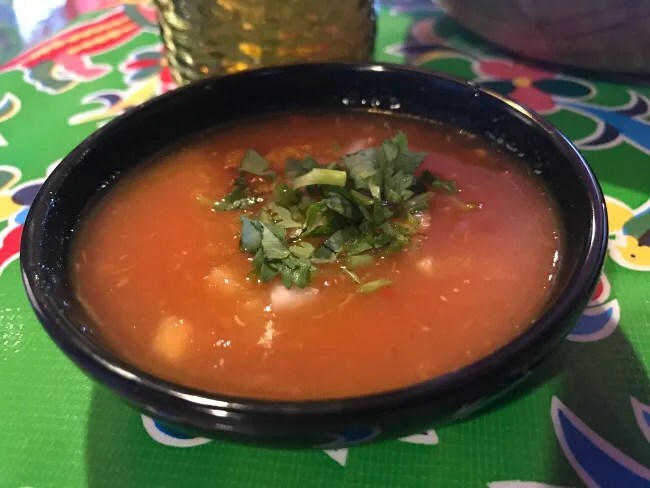 The salsa has that nice crisp, fresh flavor that is so important when it’s being used on chips like the ones served here. The plate of tacos came out before I even had half of the chips gone. The tacos are presented flat on a large plate with a lime wedge and a radish in the center of the plate. Each taco was stack with an incredibly tender and flavorful pile of steak. The steak didn’t really have a salty, Mexican flavor…it was a much deeper, much more complex flavor than I’m used to with tacos. The meat is piled on two warm corn tortillas then topped with cilantro, onions, and choice of hot sauce. I picked the hot one because I don’t like green hot sauces. There wasn’t a lot of heat but there was enough to let you know it was there. The tacos from Nonla Taqueria were some of the best I’ve ever had. They’re different than a traditional Mexican taco but different in a good way. They’re also different in price. Each taco is $3.50 which means I paid almost $15 for just four tacos. Nonla Taqueria not a cheap eats Mexican joint, but it’s worth the price that you pay. 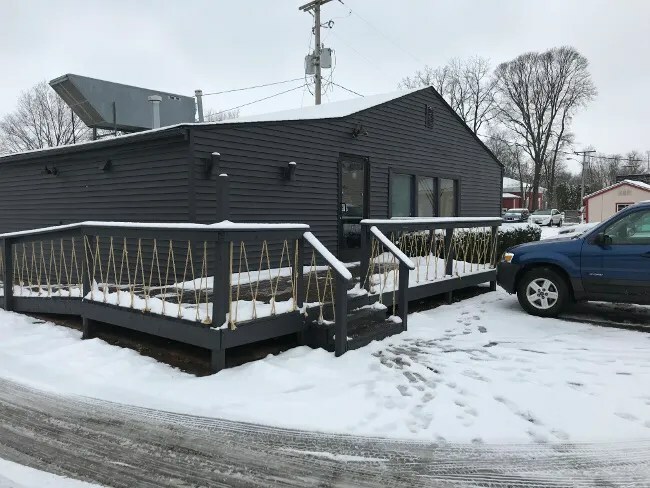 They’re place is a twist on Mexican street food that we don’t see much in Southwest Michigan. I am on my way to Nonla’s soon. 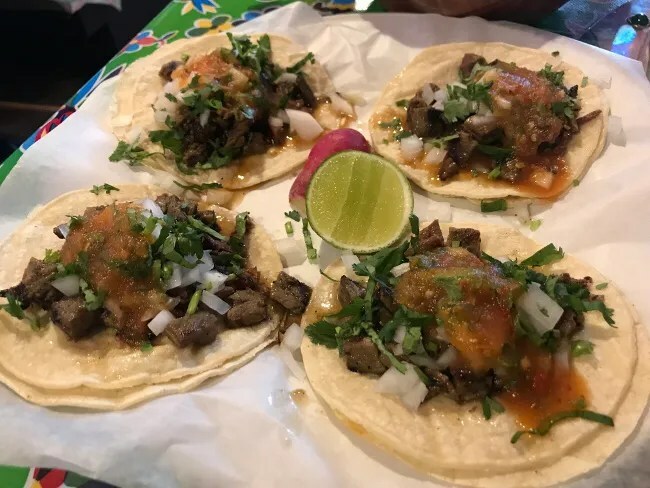 Not to take away from Nonla’s, as I am sure they are spectacular, I just wanted to suggest you try the asada tacos from La Guatemalateca. They only place I can catch their food truck (trailer) is at the Kalamazoo Farmers market. I don’t know where they go in the colder months but it is worth tracking them down. At this moment, they are the best tacos I have outside of the street tacos in Rosarita, Mexico. I get those almost every time I got to the Farmer’s Market….and sometimes make a special trip just to get them. Nonla’s are just so different than any other asada tacos I’ve had before.